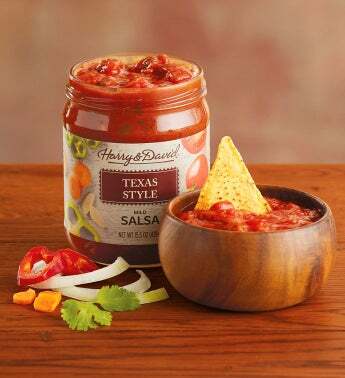 Our Texas-Style Salsa is a hearty addition to our lineup of specialty sauces and salsa dips. Crafted with tomatoes, onions, carrots, and bell pepper, this salsa is pleasantly spiced with salt, garlic, and large pieces of cilantro for rich, savory flavor. Buy salsa online from Harry & David, the gourmet gifting authority.